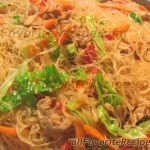 Pancit Canton or Lo Mein in chinese is another filipino dish with Chinese origin. 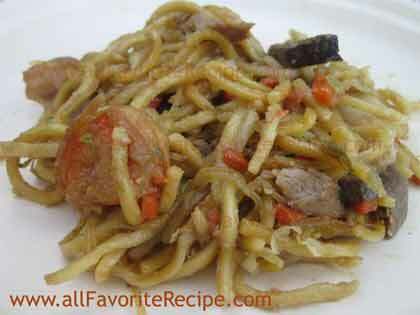 This pansit recipe becomes one of the traditional Filipino noodle dish that pinoy loves to cook in any special occasions. 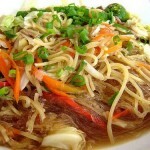 The pansit canton recipe is mostly compose of mixed vegetables, egg noodles, pork, shrimp and chicken. Peel shrimps leaving the tails intact. Coat with a mixture of eggwhite and cornstarch. Slice chicken breast into strips and coat with cornstarch. Set aside. In a wok (or large frying pan), heat oiland sauté garlic and onions. Add in chicken meat, liver and shrimps. Season to taste. Stir-fry for a few minutes. Pour in broth and bring to a boil. Lower heat and let it simmer for 2 minutes. Add in all the vegetables. Cook until tender but still crisp. Thicken with dispersed cornstarch. 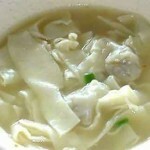 Stir in canton noodles and cook until tender. 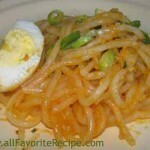 I miss pinoy food most especially pansit in all kind. Im at work now and faraway to philippines..God bless you all..